Book Review: “Reviving the Strike: How Working People Can Regain Power and Transform America,” by Joe Burns, IG Publishing, $15.95. The holiday season may have come and gone, but it’s never too late (or too early) to find the perfect gift for that aspiring rabble-rouser in your life. Before you wrap up Joe Burn’s “Reviving the Strike” in back issues of SA, though, you’ll want to spend a few hours reading and digesting it yourself. Burns, a labor lawyer and veteran contract negotiator, presents a concise summary of both the internal and external forces causing the disintegration of organized labor in the U.S. He doesn’t mince words in identifying the “only true weapon” that American unions have practically given up on but must revive in order to regain their power—the production-halting strike. To start, Burns draws a clear distinction between the meager—both in number and in effectiveness—“strikes” of today, which usually involve picketers standing around watching scabs under police and court projection march in to take over their jobs, and those of the 1870s through 1940s that brought industrial giants like General Motors to their knees. There are two key components that have been lost: the ability to shut down production, staunching the bosses’ profit lifeline, and worker solidarity, defined as coordinated, industry-wide or region-wide work stoppages. What happened since? A series of federal labor laws, designed to look “fair” to both business and labor but really targeted at the right to strike, slowly restricted the legal playing field for unions. The bosses’ robed henchmen on the Supreme Court furthered the process by ruling against workers in almost every labor case they took up since the passage of the National Labor Relations Act, at times blatantly defying the language of the act itself to do so. Liberal justices often led the anti-labor charge. Burns astutely outlines the philosophical differences undergirding the fight between labor and the bourgeoisie. To the bosses and the courts, human labor is a commodity to be bought and sold on the open market, the means of production are the private property of investors, and workers need to be controlled by management or else they act irresponsibly. On the other hand, the traditional values of organized labor held that workers are not simply meat for the grinder—they have lives and families that need support, and they are the true owners of the factories, stores, and farms because their labor creates all of the wealth that the boss steals and calls profit. A job is not a consensual contract between worker and boss that can be terminated by either party; it is a means of subsistence and demonstrates membership in a class whose collective interests outweigh the individual “rights” associated with so-called free trade (the “right” to scab, the “right” to quit and starve, etc.). Sadly, in recent decades, the crop of “progressive” labor leaders who got radicalized in the 1960s have taken on the management framework, and now speak in ways that are much more conservative than even the likes of AFL head Samuel Gompers did in the early 20th century. Today’s union officers often have wages, benefits, and job security that set them apart from the workers they represent. They fear the law and the courts, through which they could face heavy fines or jail time for daring to show the sort of real solidarity and militancy that won the 1934 Minneapolis Teamsters strike or the 1936-37 Flint sit-down strike. Many unions today operate more like the craft unions of the early AFL than the industrial unions of the CIO. They bank on their members’ job skills preventing the bosses from replacing strikers with scabs (which they don’t). They accept the precept—unthinkable before the 1980s—that their role is simply to represent their members in grievance procedures and negotiate contracts with a single employer. Perhaps the strongest section of the book details the “alternatives” to militant strikes that have been entertained in recent years, and why each has failed to take the place of the strike (though some can be effective supplements). These include one-day strikes, work-to-rule, corporate campaigns, “social unionism,” and lowering the bar for what constitutes “success.” An entire chapter is devoted to explaining why top-down organizing drives such as those conducted by SEIU are an expensive and ineffective diversion from the task at hand. There are a few notable, heroic exceptions to the modern lack of labor militancy, and Burns is quick to highlight them—particularly the 1985-86 Hormel P9 strike, the 1989-90 Pittston coal-mine strike, the 1993-94 Staley lockout, and the 2008 Republic Windows occupation. Each of these is treated to a concise analysis of its strengths, weaknesses, and the lessons workers can draw from it. These struggles are compared to the major establishment battles of the U.S. labor movement, which are outlined early on in the book. Throughout, Burns draws more on quotes from right-wing labor presidents of yesteryear than from the leftist radicals, explaining that his purpose in doing so is to demonstrate just how far to the right of the former right the current “progressives” at the top of today’s labor movement are. However, he does briefly acknowledge the contributions of socialists, anarchists, and communists in building the strength of the movement and leading many of the pivotal battles of the mid-1930s and late ’40s. One weakness of the book is its vague treatment of the role of the advanced systemic crisis of capitalism in pushing down wages and working-class standards of living. There is mention made of the more globalized nature of capital and the need to coordinate action beyond national borders, but not much specific on how workers might respond to a boss’s threat to shut down a plant and move its jobs to Singapore. Ultimately, the working class will have to replace the entire capitalist system with true economic democracy to stop attacks on its standard of living and make a better world for all. Burns does not claim to have all of the prescriptions. He acknowledges that economic and social conditions differ markedly today from the early 20th century, and along with defying and ridding ourselves of reactionary laws, unions are going to have to be creative in developing new tactics to fight our battles. He correctly asserts that “collective bargaining cannot work without an effective strike,” and also that “the system of labor control forbids effective strike tactics.” The implication is: to hell with the boss’s law—the great battles of the working class against their oppressors must, and will, be fought again. 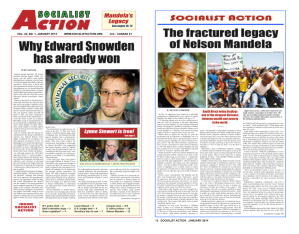 > The article was written by Carl Sack, and first appeared in the January 2012 print edition of Socialist Action newspaper.